For those interested, I just got free road runner turbo for a year because I complained my cable bill was too high and will be leaving for fios when(ever) it arrives. I complained to the guy in the live chat and he said he'd make a note on my account for the next point of contact to help me and gave me the number to the sales department. I called them, the woman I talked to didn't seem to have any idea what the online chat guy was talking about, and then I told her he was going to give me free road runner turbo, and then she was like ok. She looked up the promo code for it and applied it to my account. Said it was free for 1 year, and I just need to reboot the cable modem when I get home. 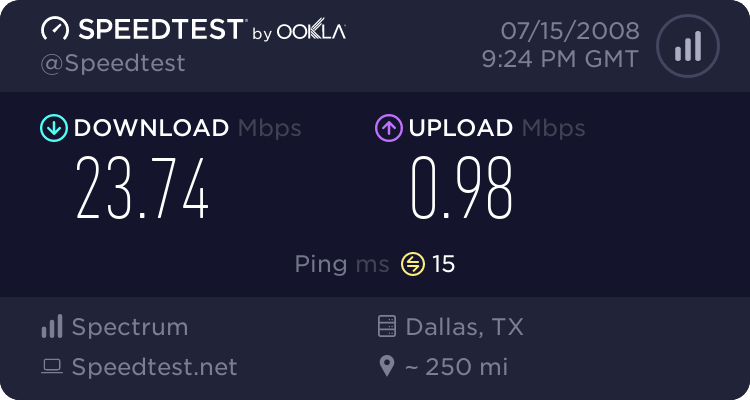 I was ok with that, it should speed my usenet along, and after a year if fios isn't available to me yet, I will just call and complain again. Good luck. What's the difference between RoadRunner and RoadRunner Turbo? After the PowerBoost stops, how long do you have to wait before you can get it again? I''ll keep the FiOS, I get the same speeds 24/7.